Have you noticed that your eyes have changed as you have grown older? Do you suffer from poor vision and want to ditch those contacts or glasses to seek alternative options to improve your eyesight? Advances in the field of ophthalmology have provided many patients with the opportunity to maintain quality vision and prevent further complications with early treatment. Whether you have a condition due to age, injury, environmental factors, or genetics, our doctors are highly trained in treating eye disorders with various medical and surgical options. Medical Eye Exams -Examination by an ophthalmologist can discover eye diseases such as glaucoma, and monitor systemic disease, such as diabetes, for possible eye complications. Cataracts are the most common cause of vision loss in the world. A cataract is a clouding of the lens in the eye. Our ophthalmic surgeons can remove the cataract and replace it with an artificial lens that restores clear vision. 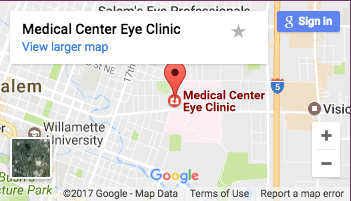 We perform cataract surgery at Salem Laser and Surgery Center, our outpatient eye surgery center, and patients typically are there for a little more than one hour. Cataracts form slowly and don’t typically disturb a patient’s eyesight early on. For individuals seeing through a cloudy lenses, however, it can often seem like they’re looking at the world through a fogged-up or frosty window. The clouded vision caused by cataracts can have a significant impact on your daily life, making it harder to see at night or even accurately read the expression on a friend’s face. While glasses and bright lighting can help you deal with cataracts during the early stages of the disease, if your vision continues to deteriorate, cataract surgery is your best option. Blurred, dimmed, or clouded vision. Problems seeing at night that continue to get worse over time. Light sensitivity or problems with glare. The need for brighter light when reading and other household activities. Seeing “halos” appear around lights. Frequent changes to your prescription eyeglasses or contacts. Double vision in just one eye. If you suffer from these symptoms, you should schedule a consultation with our Salem ophthalmologists at the Medical Eye Center. A comprehensive eye examination will provide our staff of experienced doctors the opportunity to assess the current state of your eye health. You’ll be amazed at the difference corrective surgery or treatment can have dealing with cataracts and improving your look on life. LenSx is a new technology for cataract removal. It is a laser that performs part of the procedure for people with astigmatism. Your surgeon will discuss this option with you at the preoperative evaluation. Glaucoma is an eye disease that can cause permanent and irreversible vision loss. The most common type is associated with elevated pressure in the eye that damages the optic nerve. Because there are usually no symptoms it is important to diagnose it early and prevent vision loss. We can treat people with elevated pressure to prevent or stabilize glaucoma. Diabetes is a systemic disease that can damage the eyes. We perform annual exams on people with diabetes to look for findings of retinopathy, an eye disease caused by diabetes that can cause vision loss. We treat diabetic retinopathy with laser and other treatments that are among the most effective treatments in all of medicine. The cornea is the clear window on the front of the eye. If the clarity is affected then vision loss can result. Corneal disease includes infectious ulcers, dystrophies, dry eye and many other vision-threatening disorders. We can prevent, diagnose and treat corneal disease. Our Dr. Dodd has a special interest in dry eye and has developed a center of excellence for the diagnosis and treatment of this common and troubling condition. This is a retinal condition that affects the center of vision. It is the most common form of permanent vision loss in the senior population. While the more common dry kind has no treatment, the wet variety can be treated with newer medicines that are a modern miracle for stabilizing and improving this previously untreatable disease. These laser-based treatments are used to decrease a person’s dependence on glasses and contact lenses. Both treatments use the same laser for changing the shape of the cornea and reducing the glasses prescription for nearsightedness, farsightedness and astigmatism. We have been performing LASIK surgery in Salem, OR for 20 years. This area of ophthalmic surgery includes eyelid surgery for baggy lids, poorly functioning eyelids and tearing problems. Medical Center Eye Clinic is proud to provide outstanding eye care to patients of all ages. Additionally, we have been caring for children of all ages for almost 50 years. We are proud to be the only eye clinic in Salem to care for children under the age of six.